Hints for solving common problems that may arise when using fbs. If you see output similar to Python 3.5.x or Python 3.6.x you should be good to go. If not, please install Python 3.6. (On Mac, you can also use brew by following these instructions.) Yes, 3.6 is not the latest and greatest. But installing it takes two minutes and just works. That's a lot better than the headaches you will run into with unsupported Python versions. 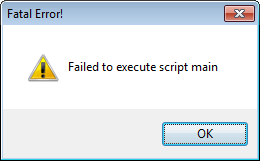 Besides main, the error message may also mention fbs_pyinstaller_hook – see further below. When you then start the standalone binary of your application from the command line, you should see a lot more debug output. If it contains an ImportError, see the section on Dependencies in fbs's Manual for a possible solution. This typically happens when your code does not define a subclass of ApplicationContext. This is required for fbs to work. Please see the tutorial for an example.